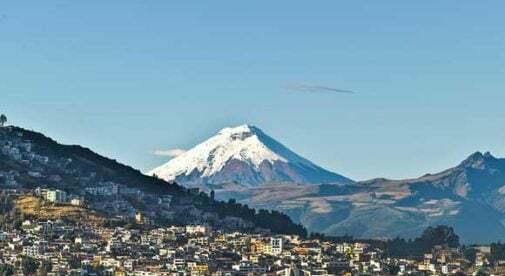 Sprawled along a valley between towering green mountains, Quito, the capital of Ecuador, is a multi-cultural and vibrant city. It offers museums, fine arts, restaurants of many cuisines, modern malls—and some great places to live. Here are just a few examples from three of Quito’s most popular neighborhoods. Let’s start with the most centrally located of the trio, the Bellavista section of town. This area lies between two of the largest parks, surrounded by major malls, and nestles amid the rising mountains and the downtown area—giving (as the name suggests) incredible views of the city and mountains to the west. In Bellavista, you can find older buildings renovated as condos, as well as new construction. There are luxury homes available, but also some affordable places. Right now, there is a three-bedroom, two-bathroom condo listed for $195,000. This is an attractive price for almost 2,000 square feet, right on the border of Bellavista and La Carolina. And that’s before I mention the fireplace, granite countertops, and even a wine cellar. Affordable rentals can be found here as well, like a two-bedroom, two-bathroom modern apartment with a fully equipped kitchen and a range of amenities for $500 a month. And with Quito‘s mild climate you will have little or no heating and air-conditioning expenses. Just south and a little further downhill from Bellavista, the community of Gonzales Suarez sits atop a small plateau. This neighborhood is predominately residential. But it’s only a short walk to the large El Jardin Mall and just minutes from the heart of the city. If you’re looking to rent, there’s a fifth-floor, fully furnished apartment available right now listed at $600 a month. It has two bedrooms and two bathrooms, and your rent even includes the water and gas. If owning your home is more your style, just down the street is a nice two-bedroom, two-bathroom unit with an asking price of $155,000. But if you want the best of everything, you need to take a look at Barrio Quito Tenis, named for the large tennis club found there. This is on the west side of town, which makes it a little further from city traffic. But that also means it’s quieter at night and a safe area. Several embassies are in this area, and many diplomats and embassy staff live here. In this neighborhood you’ll find homes that are $300,000 or more, but there are still many places available in the $140,000 to $200,000 range. Take, for example, what you can find all in a new condo building on Calle C. Darwin. This attractive section has a delightful three-bedroom, two-bathroom unit on an upper floor with a large balcony overlooking the city that is selling for $399,000. A smaller unit on the second floor with the same number of beds and baths is on the market for $253,000. Next door to that condo is a two-bedroom unit for $163,000. All three come with indoor parking spaces and security systems. Of course, in a city as large and diverse as Quito, there are many more attractive and affordable places to live. But these three neighborhoods will give you a good idea of the kind of lifestyle that may be waiting for you in this beautiful Andean city.